Back on December 2018, we sat down with the CEO of Dr. Wealth, Alvin Chow. We talked about what is Factor-based investing, what he think of 2018 and which company he is investing in for 2019! Stanley: Hello! Everyone! Welcome to our last Facebook live event for 2018. My name is Stanley, and today we have a very, very special guest, he’s a good friend, and I have been following his stuff for many, many years. He is none other than Mr. Alvin Chow; the CEO now of Dr. 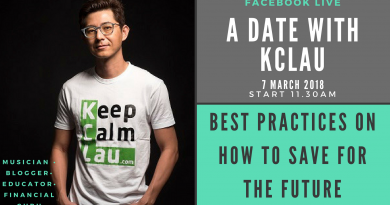 Wealth, and he is one of the key-champion of – what we call “Factor-Based Investing” in Singapore, and it is an approach that I’m still learning also, well we have a chat just now. 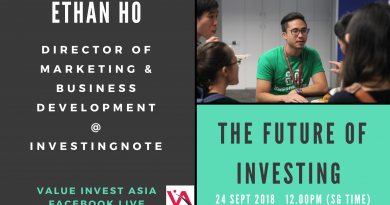 Learning about what it is all about, he will spend some time talking about that, and before that; we just want to introduce Alvin, and ask him about, how he come about becoming an investor. Hello! Welcome Alvin. Alvin: Hi! Thanks, Stanley, for having me. Stanley: Yeah! before we dive right into the topic of today, maybe you just introduce yourself a little bit. I remember, I was following you since your days in Big Fat Purse; maybe some of them might not know about that, but maybe you introduced a little bit, how did you get started in this space? Alvin: Okay! I actually started to be interested in investing in my university days; year 3 to be specific. So, I was studying Mechanical Engineering, but it was funny that I eventually found more interest in Finance and Investing, I don’t know how that came about, but it was hard first going into it; and it was 2007, it was the last crazy bull run. Probably if you guys remember, and it was a little bit funny, for me that was the reason why, I bought like warrant, that the first thing I bought. Alvin: That was because warrant is a great try. So, I could use very little money to buy stocks that are of bigger value, I still remember I bought the Costco Corps warrant, and within one week I got my money, [Unclear 02:26] and after that, the next one month I started losing Money, [Crosstalk 02:31] but that gives me some interest to continue, and to learn more about markets, then I realized a lot of things I don’t know at the point in time, and was lucky that I didn’t really get caught in the main market in 2008. Alvin: Yeah! that was also around the same time that I started the Big Fat Purse, as a blog to really write down my journey, what I learned about investing. So, it was really more personal than making public, since blogging was like getting more popular, just right it, whether anybody reads about it, doesn’t matter. It was how I got started, and then I went to work for six years, then before I decided to make this a business, and to provide financial education to the public, and that was how it happened in 2014. That was when education started. Stanley: Right! Okay. Yeah! you mentioned that you were working, I believe in the SAF after your University, but at that time you were already blogging right? During your work? Okay! but what makes you, you know, after you decided to quit from your job, what makes you decide to jump into this industry in particular? Alvin: As I mentioned, it was a passion or a thing that I really enjoyed. In fact, there were a lot of hobbies in the past I had, bicycle or all this kind of things, it just comes and goes. But this one kind of stuck around for a long time. For me, this is the real love now. Right! Get married with this. Yeah! So, I was thinking about my career and what I wanted to do, so I asked myself very simple question; will I regret not doing it, twenty, thirty years down the road? And then my answer was “Yes”. So, then it made it my decision a lot easier, so that’s why I left and started this company, yeah, and along the way we did an acquisition on Dr. Wealth; it was around 2 years ago, and we can’t I have two names right? So, we decided to choose one that sounds more professional. Less casual as the other one, it was just a choice, it wasn’t really a deliberate kind of discussion among the shareholders. Stanley: Right! I see!! Okay!!! no problem. I think more people are joining in now. Hello! JJ, and I think – Oh! my colleague; Willie is listening in as well. So, if you have any question for Alvin during this time, we’re gonna discuss about, you know, what he thinks of the 2018 market, and also what he looks at in 2019. If you have any question for him, just type it in the discussion box below, and I’ll try to get most – all of them answered if possible, but before that you are one of the persons that’s actively promoting what we call factor base investing. What exactly is factor-based investing? Because it is also something that I – to be honest, I am NOT very familiar with as well. 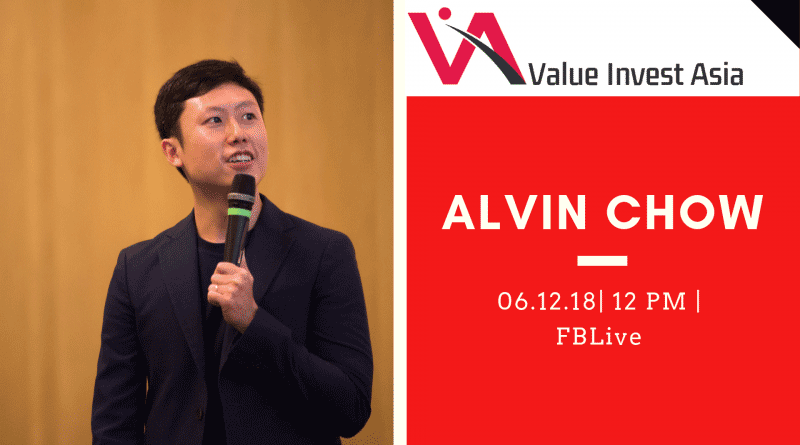 Alvin: It’s actually in one of the – I believe it was in one of the chapters of CFA program [Laugh 05:56] Factor-Based Investing wasn’t invented by me, it actually came from the Academia; the finance and economics professor based in the US. So, the most important year probably you should remember was 1992, that was when two Professors; Eugene Fama and Kenneth French, from the Chicago School of business, they started to really try to find, what really works in the market, the stock market, what really gives you high returns, and what really not? So, they are trying to prove this proof investment matrix, that’s in general the essence of it, and of course, they don’t just start from anywhere, I just look at the stock market, and see who are already successful investors, and of course, Warren Buffet was one of them, and you can trace all the way back to Benjamin Graham in 1934, and also, maybe a lot people don’t know, but Benjamin Graham has a lot successful disciples, like your Walter Schloss, Irving Kahn, and just that of course, Warren Buffett is the best of the class. Alvin: So, they started to see, is it because they’re just really lucky to be born at the right time, or no, or is there really a secret sauce to their methodology? So, that’s where they started to dig out the key metrics that they use, one of it is; price-to-book ratio, very classic value investing strategy, and they also realized that some of them tend to buy the smaller cap stocks, then they started to test; Okay! Let me use data, financial data and let’s say you form a portfolio of ten – ten different portfolios of stocks, and you form them by grouping them into their various degree of price to book ratio, let’s say you buy the cheapest group; which is a lowest price to book ratio, versus the higher ones. what they found was that, the cheapest group stock defined by the lowest price to book ratio actually delivers higher returns than any other groups with the higher price to book ratio. So, in the essence, it proofs that just by quantitatively [Unclear 07:53] blind, they just formed this portfolio based on just this one metric, the found that you can just deliver high returns, and there was the same for the small cap universe. They found that smaller cap stocks tend to deliver higher returns than big cap stocks. Right! So, in their 1992 paper, they kick started this factor base investing, it got a lot more of the attention in academia, and they started to research other things, what other metrics, or other factors may work in the stock market? So, things like profitability, higher profitable stocks, dividend high returns, then lower profitable stocks. This one is no-brainer, but the characteristics are very different from deep value stocks, because highly profitable stocks maybe sell it very cheap, and cheap stocks and maybe sell it very profitable, but even if you buy the very cheap one or you buy the very profitable one; either one will still give you decent high returns. They started to find more and more such factors, and that’s why the whole movement or the whole campaign is called factor-based investing. Stanley: I see! Okay. It’s all coming back now, it’s all coming back now. I remember, should be from level 2 of the theory… but for what you discussed, because it’s not just one style of investing, it is a combination of styles. So, should the investor just focus on maybe one niche of it, or from your opinion, you should have a holistic approach. So, they should have stocks within each different factor here to say. So, how do you control your portfolio? Alvin: So, it is yes and no, let’s start with a simple explanation first of all. So, yes in the sense that any investor, can just focus on one factor, lest say you prefer the value factor, that you want to build portfolio value stocks; it’s fine, or you want to build a portfolio of profitable stocks; it’s also fine, the only good thing is that, if you go from factor based approach; at least you know that the metric is proven, and statistically, if you use this right, you have an advantage over the rest. it’s not blindly just you know follow your investment strategy. So, I think that’s not a bad thing, the only downside is that, we all know value don’t work every single year, some years that value don’t work as well as profitability, and vice versa. Profitability also doesn’t work every year. So, the new belief is that, besides just doing as allocation, like your stock bonds, commodities, etc.… even in stocks itself, you can also diversify by factors. Like value and profitability; these two very distinct kinds of stocks in your portfolio, and you put them together, your overall profitability will smooth up. One works better than the other, and in different periods of time. Stanley: I see! Okay. Can you share one myth? I think a lot of investors tend to assume is the case, but you mentioned to me just now one particular case, I find it very, very interesting from the research on the paper that actually that factor doesn’t prove to be high written. Can you share a little bit about that? Alvin: Yeah! A lot of investors prefer stocks that have high ROE; Return on Equity, or even high ROA; Return on Asset. This either one, but research has found that they don’t really give you extra returns, over to the indices for the main period. So, that’s why I prefer this kind of using her research, because it’s a lot more objective, and it’s proven by somebody has done the proving, I don’t need to do it with my own money, that’s why I will rather like stand on the shoulders of giants, and just apply what I’ve learnt. So, there are a few explanations, so the funny thing about factor-based investing is that, there are many, many explanations. I will prefer usually from the behavioral finance point of view of explanation, again because the market is so complex, nobody can really find a causation, one other explanation is the high earning stock tends to attract competition, because let’s say this industry, while you’re already making your own money, you attract the attention of other people going in, and then when you have more competitors, you probably have to be a lot more price competitive, and that’s where your returns may drop. So, from the point, and of course, Warren Buffett came up with those idea; competitive advantage; I want an economic moat, they will surround this that other people cannot take away. Yes! So, in fact there are outliers, I can’t remember where I got the statistics, but they are about 4% of this higher risk stock will not be destroyed by competitors. Alvin: Yeah! So, the odds of it is very, very low. So, if you really want you to defy the odds, you have to do a lot of work, and this is probably why Warren Buffett concentrates more on portfolio, because you saw how to find and you find one you better pull lines here. Stanley: I blame on Buffet because he is the one advocate High ROE. Stanley: His mind certainly works differently from ours. Okay! More and more people are joining in. Hello David! Hello Mike! Karina! WOW!!! Okay. Kari is asking if there is gonna be a transcript for this Facebook live? Yes! but please give us some time, because we need to spend some time to write down all the words. So, it would take some time, I hope you can join us throughout the full session of Facebook Live. Yeah! Let’s dive right into what our main topic for today before we talk about 2019, how has the year been for you, 2018? Stanley: What are some of the – I guess, what’s the main concern that you’re seeing maybe even for your portfolio, is there a real concern that you have, or what’s happening, how do you see this year? Alvin: I – Psychologically, I always prepare myself that I may need to hold through the crash, I pull myself through the crash, I know there are a lot of investors, who are very fearful of the crashes, and that’s why they always try to find out; are there any indicators to tell us whether the market is crashing? So, they can sell their stocks and exchange cash, but I think it is very difficult, and there’s also a price for mis-timing. For example, I hear people talk about, Oh! The stock market is crashing since five years ago, and you probably have lost out a lot of gains. Yeah! even though the portfolio is down this year, we are still positive over the past five years. So, [Unclear 15:15] so I think mistiming is also very heavy price to pay, so that’s why – yes, it doesn’t feel good for the portfolio to go down, but I don’t believe that I can sell everything before the crash so with that, I actually be a lot more psychological stable; say that it is fine, market is like that, we don’t have to respond to it, and have knee-jerk reactions, just because we don’t feel good. Stanley: Yeah! this is very similar to my thoughts, I realized that every time I tried to time the market, every time I’ll be wrong, because I have been thinking that the market is expensive for the past three years really, but luckily I stay invested as well, but looking at 2019; I think a lot of market has actually declined, especially the Hong Kong market, and the Singapore market. Now, we have one of the lowest valuations around Asian-Pacific, what are you looking for in 2019, which industry in particular that you really seize that opportunity right now? Alvin: Okay! First of all, I think Asia has been very bad for the last few years, and if – because personally, I also invest heavily in Asia, relatively to the United States. So, it’s very normal to look like a fool for the past few years, because the Asian market is doing very badly, and I also agree with you that Hong Kong and Singapore are cheap, and in particular, I think Hong Kong is very, very cheap, and in fact more than half of my portfolio is in Hong Kong itself, but that doesn’t mean that there’s no gems here, there are still quite a number. In terms of the sector that I believed in, I think I can’t answer that question properly, because it’s due to the methodology that I use, which is factor-based investing. So, based on different factors, you’ll give us different kind of sectors, and there’s the other beauty that you would diversify actually to different sectors. I don’t do sector picking, that or this sector is turn around, I’m going to turn around, maybe I’ll look at some stocks there, no I usually go by factors. For example, value will tend to give you like property stocks, cash rich stocks, then your profitability factor will give you more asset like kind companies; tech education, F&B. So, I tend to approach with diversify sector kind of exposure as in case, because I don’t know just way into one, and then got it wrong. Stanley: Okay! Right! That’s Fascinating, on the follow up question; if you’re looking at mostly of the factor, the criteria that you’re looking at, how do you decide on your portfolio allocation, is it based on one factor or based on the companies itself? Alvin: It’s actually at two levels. So, you’re right at both levels. So, the first level is at the factor diversification; that would be a bit tricky, why I say that is because, of course, the best is half-half. Let’s say you want to do value half, then profitability half, then it becomes very balanced, but of course, in the real world, it may not be so nice, and tidy, and orderly. So, for example, it’s a lot easier to find value stocks than profitable stocks. So, naturally your value factor would tend to be large exposure compared to the profitability factor. So, that’s one, and then at the second level, at the stock level; I tend to put more money into a profitable stock, and less money into a value stock. So, in other words, my value side is more diversified, whereas my profitable side is a lot more concentrated. Yeah! and it’s also because for profitability as I said, you find less stocks, that’ll show you how to concentrate more. Stanley: So, you’re saying most of the stocks on the stock market is not profitable? Alvin: I’m not saying they’re not profitable, it doesn’t warrant definition of profitable from the factor point of view. Stanley: Okay! Cool! Great! that’s interesting. Yeah! maybe I just take a short break, because I just want everyone to know that this show is actually sponsored by our sponsor FSM1; which is one of the lowest cost brokerage in Singapore, we try to find partners, that we can work together for a longer time, and one of the key question I always get is which broker should I use? We have really searched in Singapore for a long time, and FSM1 was really one of the ones that is able to give us a good interface to trade, but also offers a good value, and very transparent in their pricing. So, if you’re looking for one brokers for you to start out with, do checkout FSM1.com for them. Alvin: I have FSMone for my son. Stanley: Ah! very good! Yes! Yeah. They actually have an account that you can study as a beneficiary right for your son but you can control it for a while. So, you can change your decision next time, if it’s not nice for you. Okay! Looking at 2019! Right! Okay. Let’s go down to the specific, of course you guys, if you have any questions also, do comment down below. One question that I have previously when we sent out the email to everyone, the invitation is from BL, I think he’s one of your followers, maybe because he asked; he is basically saying, that you have been, you “Alvin” has been a great promoter of the ETF, Using ETF, and just want to understand. Do you see the risk of ETF, because some ETF, they need market makers to make sure that they have enough liquidity, do you see this market makers as a risk, how can we be sure that they will always be there when we need a liquidity? Alvin: My understanding about market makers is that they are usually hired by the issuers, and so you’re right if the liquid is low, the thing you need the market makers to hold inventories of the units, to be in a buy and a sell site. when an investor’s need to complete the transaction. So, I don’t think that the risk of market maker or should I say, I don’t think the risk is at the market maker. [Crosstalk 22:02] If ETF’s become like a dominant investment vehicle, it might become risky. Alvin: So, for example in Singapore, I don’t think we see the problem now, or even in the US, yes is increasingly getting riskier in the sense that, a lot of money are moving away from active management to passive. The US’s, hedge funds are losing, ETF’s getting the fund manager, and the problem is that ETF’s are like very rule-based kind of investments. So, for example, I invest in S&P 500 ETF, the manager is only mandated to buy the S&P for ETF’s. So, if they become too large, they became the one that pushes S&P for index up. Correct? and then we’ll basically say well so easy to make money, then you plow more money into S&P for ETF, and then the manager will blindly buy the foreign companies, the same exactly foreign companies, but the thousands of stocks in the US but this finally will get them attention over and over again, and that pushes up the index for them. So, that is that reason I’m talking about, because that is a virtual cycle, the reverse would be a visual cycle, if people pull money out, the index will fall faster. The most feared consequence is that stock market crash might be larger than it would have been without its ETF’s. By this point I don’t think we had a stage here that ETF’s are controlling the market, I don’t think so. Stanley: Yeah! I actually have exact same view as you in, I think that’s really a key race for ETF, because ETF is almost – when they say passive investing, it’s almost investing blindly, you don’t even know what’s inside, and everyone is just plowing in because it looks like the simplest way to do it, and when the trend reverse, everyone will also rush out at the same time. Especially, ETF is so equipped now in the US market. Okay! For 2019, let’s drum roll; what is the – maybe you want to share one stock with us today, what’s the one stock that you will share with us today? Stanley: On that first catalyst, did they already mention that they’re gonna they already use the proceeded to like 800, or give a special dividend? Alvin: Although, there was a speculation from analysts, I think they meant to being in promise. Recently, they just sold the downtown, OUE downtown to their OUE Com REIT for some cash over there as well. That’d be a right issue for Com REIT, they are doing a lot of restructuring in the Riady Empire, and it is clear to me that OUE is like their centerpiece; their chess master, so which means they will definitely make that look a lot better than rest. So, I think that is the stock that I think is interesting, and their near-term catalyst is coming. So, another catalyst is that, OUE Downtown also have a hospitality section, I think is service apartment if I’m not wrong, also approve for shut time stay, so I’m not sure whether they’re going to turn it to a hotel, that could also be sold to OUE Hegde Trust, and there was no recycle to capital King. So, I think in the next year with all these things being sold, the company will deliver, their debt will come down to a more manageable level. The last one is another catalyst that the management also mentioned, because they also bought bolst REIT, which is the manager for First REIT, and we know that this kind of property AUM management kind of business is very good. Just take a look at ERA estate management, so is that kind of idea, they might list that, and that would have more cash coming back to OUE again. They didn’t say its Bowspring REIT, but I’m guessing that it’s Bowspring REIT. Mostly because, it is a top management platform, this reform… I think we have quite a number of catalysts that’s coming up, and maybe because of all these probes and issues, they might want to move even faster to make sure that clients are protected, because OUE is run by Stephen Riady, not James Riady, his brother. So, maybe they want [Unclear 30:02] Oh so, I think the mess is good for the share price because it is probably priced in and then with all these catalysts coming up, things might get rosier next year. Stanley: Okay! Interesting, when you talk about this – I think you mentioned this now their P/B, they are trading less than 0.4times their NAV, but this company, is most of their business still coming from asset ownership, or more from the development business? Alvin: Actually, more from the asset – the investment property; a big chunk of their assets. The development side, I don’t think they have much now after Twin Peaks, and it’s always very lumpy. So, my view is always that, focus on a core; which is the investment properties, rental, there’s more baseline recurring, then just treat as development properties as some bonus, revenue bonus profits. That’s how I usually see it. So, I usually discount the development properties. Stanley: Okay! Yeah. So, you usually discount the development properties. Alvin: I only get a core on investment properties. Stanley: Right! Okay. when you talk about the company being a bit highly geared, but you see that they have plans to reduce that down, following some of the merger, and also spin off, but when you compare it, I was going to ask, when you compare it with some of the other – also high quality property companies; say like Hong Kong land, also trading roughly about I think around 0.4, 0.5 of NAV. When you choose this kind of devalued stocks, would you rather just buy the bulk of them, or you still prefer to just stick to one OUE? Alvin: I think it’s not wrong to just buy all of them. you never know, who is gonna have the catalyst, if you know what it means, and you buy it, it means its insider trading. Stanley: I think that they prefer to just keep it to themselves, especially when these companies donate the cash. Alvin: So, as OUE now; they need to deliver, they need to push their balance sheet. So, I think there is some push with the parent company, maybe there’s really some push that they have to do something about it, and when they do something about it, there’s a chance and there’s a catalyst. Stanley: [Laughs 33:23] Yes, very optimistic way of looking at it. I wanted to ask you also regarding the diversification of these devalued stocks, because you say it’s better to have wider diversification. When we look at investors like Walter Schloss; who championed and is one of the best devalue investor around and also maybe in Singapore, some of the good firm managers, who devalue like aggregate or human capital, they tend to own many, many stocks or a few hundreds, that might work for them, given that they are a firm, but for individuals like us, how should we – you know, it’s impossible to diversify and do such a big wide range, and well; do you see us just owning like five to ten of these devalued stocks as risky, or do you think we are almost as diversified as the big guys? Alvin: My view is that, share minimally fifteen. Alvin: So, I think that five to ten is a bit risky, for a devalued professional, because it’s just a statistics game, devalued works, but you don’t know what works, which specific stocks work beforehand, you only know who got that right, but it’s too late if you know after that. True, you have the form portfolio of that devalue, and you must have enough sample size per say, [Unclear 34:51]. So, if you have too little, it’s either you do them well, or you underperform very seriously, so usually say minimally 15; one five, in different sector. So, you can buy Hong Kong, then you buy OUE, that’s two property sectors. Stanley: Okay! Okay! Cool! Well, thank you so much for your time today Alvin, I think I learnt a lot today, not just on factor-based investing, and of course, I’ll definitely go and check out OUE Limited as well. You guys as well, if you have any last question about OUE Ltd., if not, do check out the stuff that Alvin is talking about, and also if you want to check out more about Dr. Wealth; you can go to drwealth.com, and I’ll share his page up on the screen, if you can see it, where he talked more about what is factor-based investing. I’m not sure if you have the time table for maybe your next workshop on the website. would they be able to find it out? Alvin: Yeah! there is, and actually, I need disclosure; we own OUE Ltd. I want to disclose it. Stanley: Okay. Do check out his website at drwealth.com to find out more. 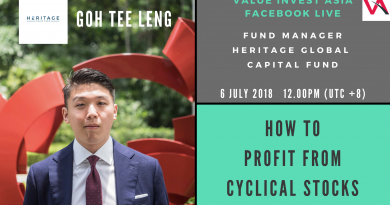 That’s it from us at Value Invest Asia, the final Facebook live for 2018. we’ll see you guys in 2019. Thank You Alvin. Cheers. Alvin: Thank you Stanley, see you. ← Is Ajinomoto (Malaysia) Bhd A Good Stock To Invest In?